A decadent Spiced Rum Truffle Tree, made from smooth truffles and red edible roses, a truly luxurious & scrumptious present for someone special. Sugar, cocoa butter, whole milk powder, glucose syrup, coconut oil, butter oil, milk uht cream , alcohol Rum, invert sugar syrup, , citric acid, emulsifier, soyal lecithin, natural vanilla , may contain nuts, Flavours tonic. 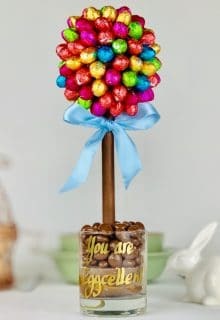 Chocolate Ball – Rice Krispies ingredients: Rice, sugar, salt, malt flavouring, iron, ascorbic acid (vitamin C), alpha tocopherol acetate (vitamin E), niacinamide, vitamin A palmitate, pyridoxine hydrochloride (vitamin B6), riboflavin (vitamin B2), thiamin hydrochloride (vitamin B1), folic acid, vitamin B12, vitamin D. Inverted sugar syrup, sugar cane, sugar beet juice, wheat flour sugar, malt extract, vegetable oil, wholemeal, sodium bicarbonate, tartaric acid malic acid salt. Sugar, Palm Fat, Shea Oil, Whey Powder (Milk), Fat Reduced Cocoa Powder (7%), Dried Skimmed Milk, Emulsifier (Soya Lecithins), Vanilla Extract. May contain Cereals containing Gluten, contains Milk, may contain Nuts and Peanuts, contains Soya. Cocoa Mass, Sugar, Cocoa Butter, Whole Milk, Emulsifier,Soy Lecithin-E322, Flavouring, Natural Vanilla.Powder Cocoa.